The earner of this badge has EQF level 3 competence in preparing and implementing methodology in an adult education course or event. This badge was earned by providing evidence of at least 3 out of 5 criteria and based on self-assessment. Apply here / Hae merkkiä täältä. 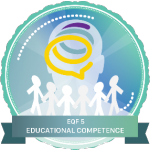 The earner of this badge has EQF 5 level competences in independently preparing, conducting, evaluating supervising and developing the evaluation of an adult education course or event. This badge was earned by providing evidence of at least 5 out of 7 criteria and based on self-assessment. The earner of this badge has EQF level 4 competence in preparing and implementing methodology in an adult education course or event. This badge was earned by providing evidence of at least 4 out of 6 criteria and based on self-assessment. The earner of this badge has EQF level 3 competence in carrying out adult education courses or events in accordance with non-formal adult education/Nordic folkbildning principles. This badge was earned by providing evidence of at least 3 out of 5 criteria and based on self-assessment. The earner of this badge has EQF level 5 competence in preparing and implementing methodology in an adult education course or event. This badge was earned by providing evidence of at least 5 out of 7 criteria and based on self-assessment. The earner of this badge has EQF level 4 competence to independently carry out courses or events in accordance with non-formal adult education /Nordic folkbildning principles. This badge was earned by providing evidence of at least 4 out of 6 criteria and based on self-assessment. 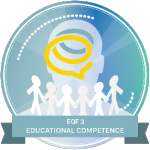 The earner of this badge has EQF 4 level competences in independently preparing, carrying out, developing and supervising the evaluation of an adult education course or event. This badge was earned by providing evidence of at least 4 out of 6 criteria and based on self-assessment. The earner of this badge has EQF level 5 competence in designing and carrying out adult education courses or events in accordance with non-formal adult education/Nordic folkbildning principles and can also guide others in their professional development. 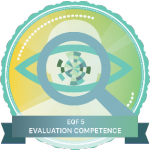 This badge was earned by providing evidence of at least 5 out of 7 criteria and based on self-assessment.